Inspired by exquisite craft from the countryside, this Cottage Lane Lift Top Cocktail Table lends itself to a sophisticated functionality. 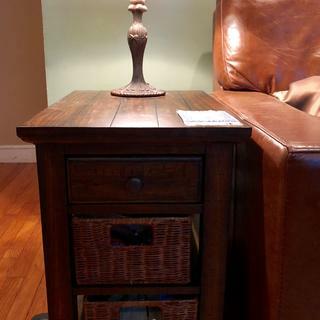 Set in dark rustic finish with a textured details, this cocktail table features antiqued metal knobs, shapely carved feet, and a lifting surface providing additional hidden storage. It also features four storage drawers and two woven rectangular baskets which can removed and inserted again at your convenience. 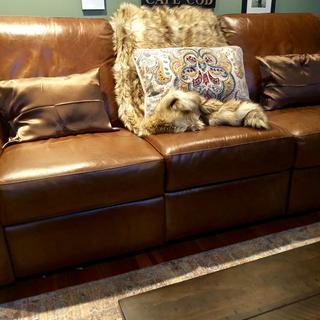 The best Coffee Table to have with recliner couch! Love this Table! It opens and lifts up to be a Table so you can eat and watch TV! Also, we have a leather couch that has power recliners and this coffee has hidden wheels behind the wooden legs so all we have to do is gently push the table as the recliner opens! Amazing! And plenty of storage space! Very pleased with the overall quality and ease of cleaning We do find the lift top to be about two inches too high in elevation for easy dining. 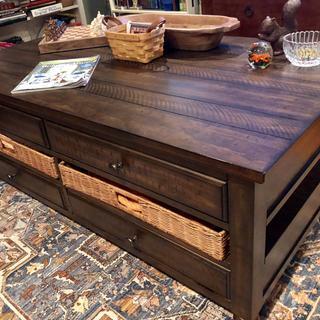 This is a very sturdy coffee table and reasonably priced.